If your choice of fonts is the only thing that distinguishes your company's website from thousands of others, including your competitors, you need to consider a redesign. 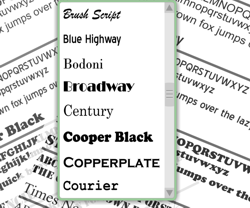 While automated site design tools can offer you a dizzying array of font choices, they can't ask you with what makes your business unique. Successfully projecting your business to the internet requires a team of design, development and marketing professionals all working together to understand your company, business goals and brand identity. At UWS, our a team will not only help you avoid making rookie mistakes with your site, but will ensure that every aspect of its development reflects your company's message and keeps it on track to reach your online goals. Understanding the goals and challenges of our clients, UWS hand codes amazing web sites and develops strategies to keep them updated optimized and focused on success. If you want your site to say more about your business, call us today. If your choice of fonts is the only thing that distinguishes your company's website from thousands of others, including your competitors, you need to consider a redesign. While automated site design tools can offer you a dizzying array of font choices, they can't ask you with what makes your business unique. Successfully projecting your business to the internet requires a team of design, development and marketing professionals all working together to understand your company, business goals and brand identity. At UWS, our a team will not only help you avoid making rookie mistakes with your site, but will ensure that every aspect of its development reflects your company's message and keeps it on track to reach your online goals. Understanding the goals and challenges of our clients, UWS hand codes amazing web sites and develops strategies to keep them updated optimized and focused on success. If you want your site to say more about your business, call us today.